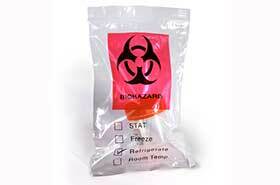 2 MIL, 3-Wall clear biohazard bags. Outer pouch to keep paperwork separate and dry. Pre-printed biohazard symbol with check boxes for processing. Made of pure virgin low density polyethylene resin. Constructed with a reinforced side welded zipper lock. Meet USDA and FDA specifications.